Again I only managed to take two things off my last list, but again I’m hoping to do better this time round! The problem is that things get added to the list faster than they get taken off! 1. I’ve been making blocks from the Modern HST Sampler this year, but at a quarter of the size. 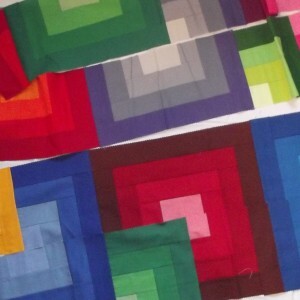 Now that early all the blocks are made it’s time to think about joining them into a finished quilt. 2. This is a quilt top of a baby quilt from a pattern in a magazine. I’m now deciding on how to quilt it so I can finish it off. 3. 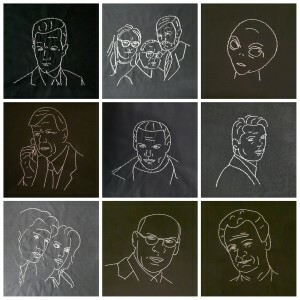 I have been making the blocks for the X Files quilt from Fandom in Stitches. I have finished all the blocks now, so I’d really like to put them altogether and get this finished in time for Christmas. 4. 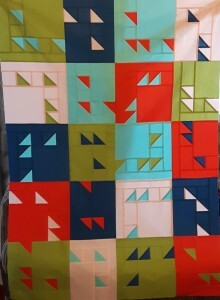 I completed the quilt top for the Modern Blocks QAL, but that is as far as I got. It needs a back and then quilting and binding to finish it off. 5. 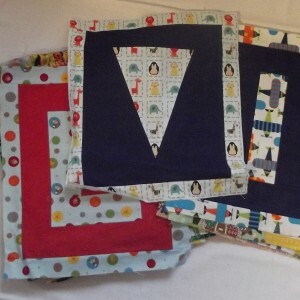 I have a full set of blocks now from the Easy As ABC QAL. 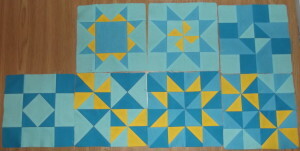 These need sashing to create a quilt top before finding a backing, quilting and binding. 6. 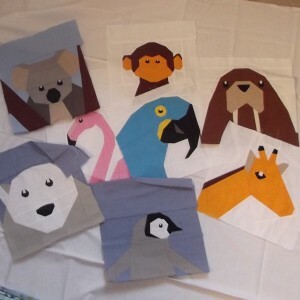 Last year I made animal blocks in the Zoo Animals BOM. I have one animal left to make – the lion – and then it needs making up into a finished quilt. 7. 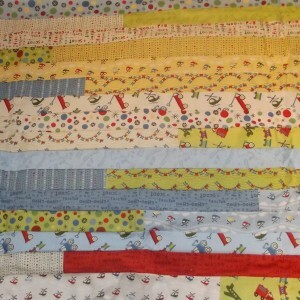 Many moons ago I started this jelly roll quilt. It needs some borders to make it into a useable size. I also have matching fabric to piece a back before quilting and binding it. 8. 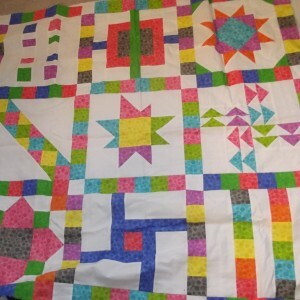 This is the first quilting project I started, but it never got finished. I have four completed rows. I think there are two more to complete the top. 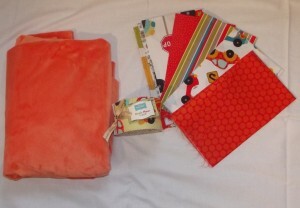 The fabric is all bagged up ready to make them, and then this also needs a backing before quilting and binding. 9. 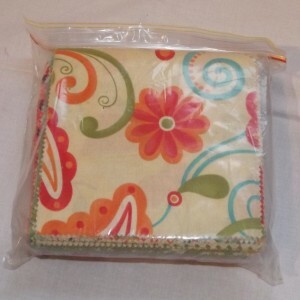 This pack of material was bought several years ago to make a quilt for my son. I designed how it would look – which should still be on my computer. It would be nice to finally cut into this material and get the quilt made. 10. 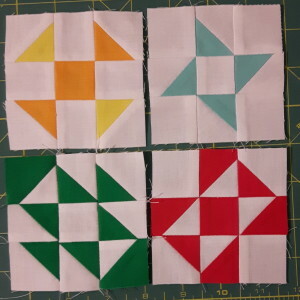 I collected 3 charm packs of Moda Sassy to make myself a charm square quilt. I don’t make many things for myself. This is another one that really needs to move from barely started to completed. 11. 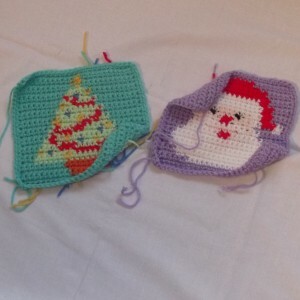 These squares are the beginnings of a Christmas blanket I started last year. With a bit of luck I might be able to finish it for this Christmas! 12. 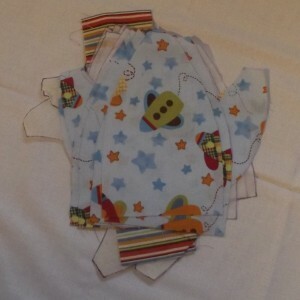 These pieces are cut out ready to make a sun hat, and have been for about three years. The hat wouldn’t fit the eldest anymore, but if I finish it now it should be just right for the smallest! 13. I’ve been participating in #100days100blocks, making all the blocks from the Tula Pink book 100 Modern Quilt blocks. I’ve done well to keep up and want to turn them into one big quilt when I’m done. Realistically this isn’t going to get finished this quarter, but hopefully by putting it on the list I’ll at least make the quilt top! 14. I started the Farmer’s Wife QAL last year but haven’t done well with making the blocks this year. This is another thing that’s unlikely to be finished this quarter, but I’m hoping to at least make some progress. Hopefully there won’t be much left on this list as we go into 2017!